Fred Archer was from the village of Ashton-Under-Hill, in the Vale of Evesham, in Worcesterhsire, in the West of England. The area is primarily agricultural - with rolling hills, hedgerows, fields and orchards the rule and not the exception, even today. 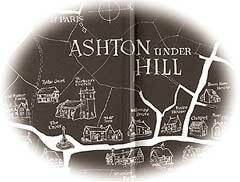 Ashton-Under-Hill lies in the shelter of Bredon Hill, a local landmark made even more famous by Fred himself in many of his books. The village has many intersting old farm buildings, a church and an excellent pub. The Vale of Evesham and Fred's village are about 25 miles south of Birmingham - click map links below for more detail. from 'Muddy Boots and Sunday Suits'.